Tulle is the stuff of ballerinas, fairy wings and fantasy. The fabric is ethereal, weightless and oh-so-dainty. Until recently, tulle traditionally was available in pink, powder blue and other pastel shades, but now it comes in every color of the rainbow, from hot pink to burnt orange. This makes it a great material for unique, fun fashion accessories. 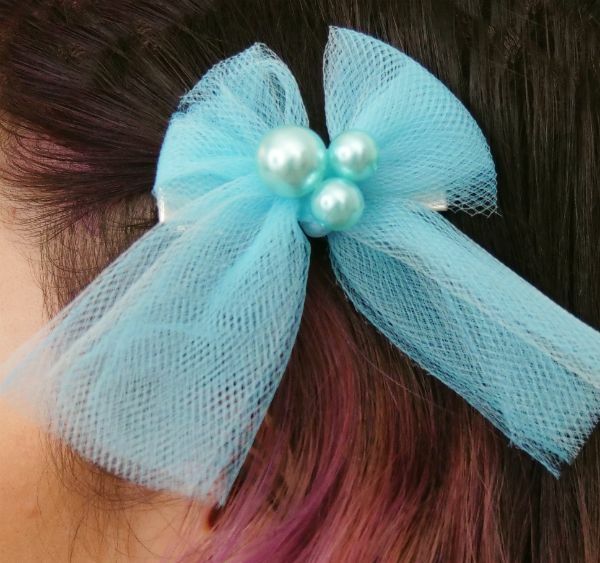 This tulle hair bow project is straightforward, requiring just a few easy-to-get supplies. Whether you intend the bow for a little girl, a slightly spoiled puppy or someone else, it will surely make its wearer look much sweeter. 1. Cut two 6-inch pieces of tulle in one color. 2. Measure and cut another piece of tulle of the same size but in the other color. 3. Place the tulle pieces on top of each other in the order in which they were cut. The piece from the second roll should be on top of the first two pieces. 4. Pick up the three pieces together and use all of them to tie a fairly tight knot in the center. This will unite the pieces of tulle so they act like a single piece of fabric. 5. Tie a bow on top of the knot, using the tulle sections on either side of the knot. The bow loops will be above the knot, and the tails will be below it. 6. Spread the upper loop portions of the bow so they are fanned out instead of tight. 7. Cut about half of the excess tulle from the tails of the bow. 8. Hot-glue one large and two small pearls to the center of the tulle bow, between the loops and just above the bow tails. 9. Apply a dot of hot glue to the center of one side of the alligator clip. Attach it to the back center portion of the hair bow. 10. Let the glue dry before wearing the bow.